Towards the end of our time in Canada we had one last adventure to tick off the lists. To head as high up into the big mountains as possible. 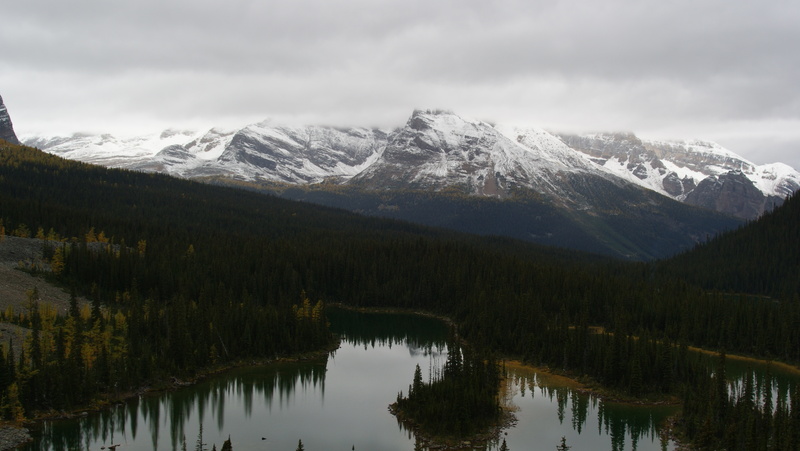 I remember looking at a map, and then again on the trail of six glaciers walk at Lake Louise and seeing the hut, perch ominously high atop the Victoria glacier in another realm and thinking….I need to get there. The weather forecast was foul, but we were going regardless. 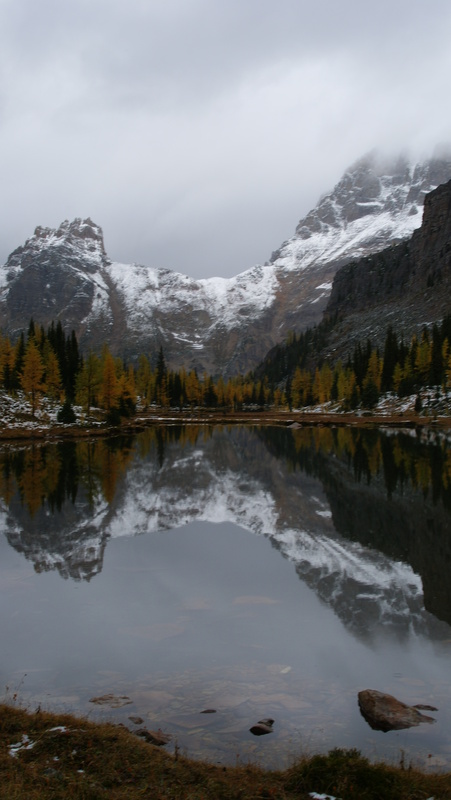 Lake Ohara involves a 10km bus ride in by the national parks to limit numbers and we eagerly jumped on amongst the midst of hikers. There was 7 our party, Laurel & Riggs, Laurels brother Alex, Rosie, Cat and myself. All venturing to the hut for the first time. 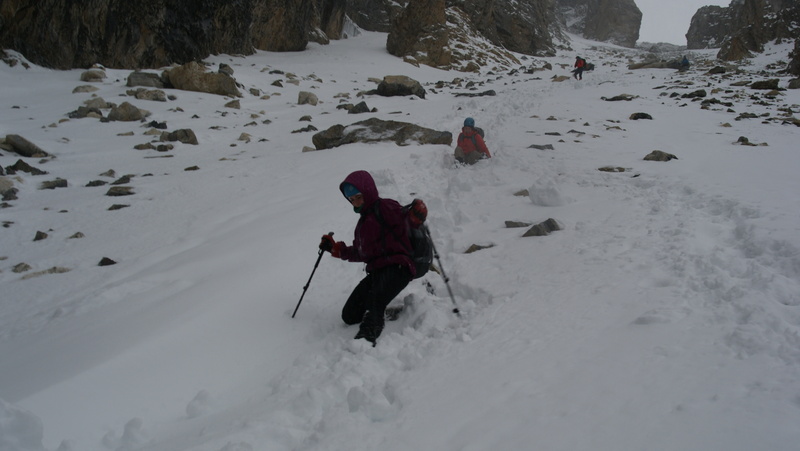 The previous week had made conditions sceptical at best with a lot of snow on the ground in the lower valleys and more in spots around the higher valley where we got off the bus. 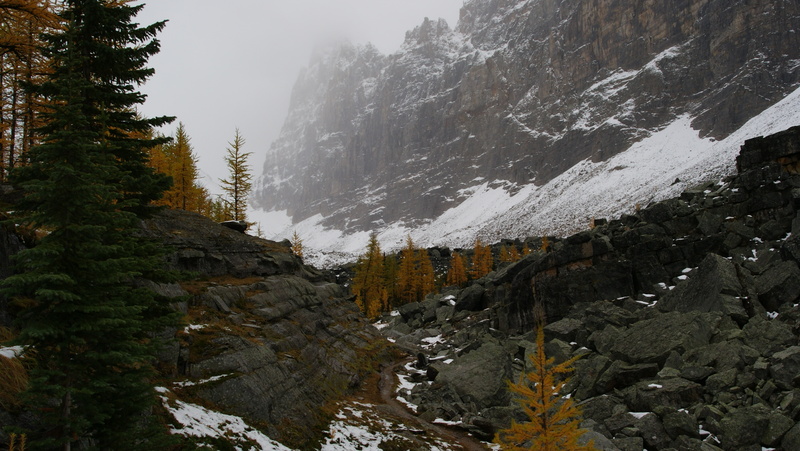 We took a round about route up beyond Opabins prospect and to Moors lakes to see the last of the larches in the winter haze. Glorious golden sentinels saturated in a frosty mist, with a view back down the long valley 15km out. A pause for a snack and to indulge the serenity before marching on across the hioghline trail of yukness ledges to the bitter cold and damp shore of Lake Oesa. Lunch time as we looked upon the daunting 600m scree slope straight up to the hut on and angle of about 45-60 degrees. High avalanche and rock slide danger, and when I say high, it is essentially a avalanche shoot with the visibility disappearing around half way up. Well lucky we packed the helmets and poles eh? 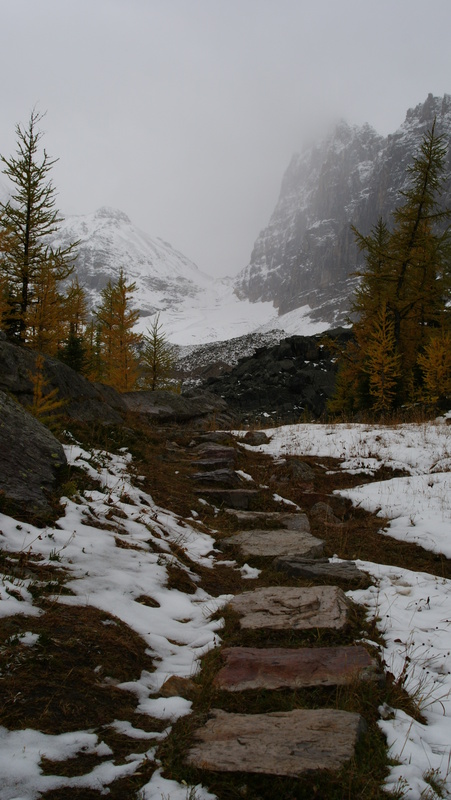 We rug up and power up the lower levels, making our way further round beyond the left hand shore of the lake and up over the far point of the huber ledges. We march up the scree slope quick. snow is up to our thighs in some places and there are no clear paths or tracks. 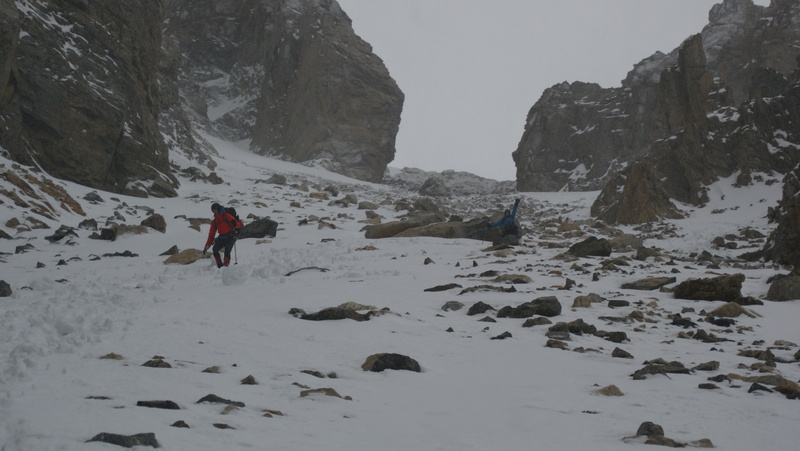 We loose ascend into a blizzard with around 100m of vertical to go. Visibility is down to 30m and the wind is ferocious. We have split into two groups and plow on fast. We can’t stay here! heads down and charge. 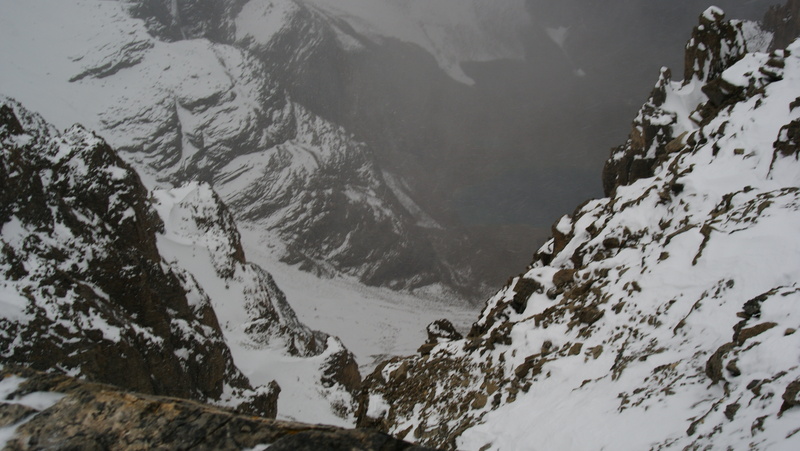 Its steep and slippery, rocks giving way at every second hand hold and ice laced wind pelting out faces but shortly we crest the cliff after an almost vertical final 20m. We see others in the hut and bust the door in to a cheer! All safe, fire wood is turned out along with a few drinks, and some delicious yet mysteriously flavoured cookies (thanks Laurel!) and we settle in for the night while the blizzard howls on. 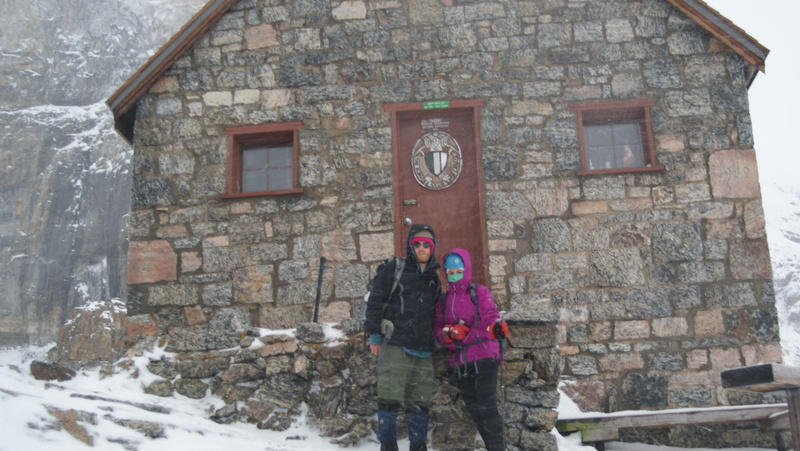 It doesn’t let up all night and we go to the bathroom peeing down into the dark of the cliff of the glacier. No stars and no sunset which is a shame, but it adds and eriesness to our current location that I’m almost content with…like its better not to see or know whats beyond the cloud layer? 6 hours of hiking with about 850 of vertical. worth every moment.